You are probably using some type of backup software from a commercial vendor. I have been too, but recently I stopped using it and switched to a Built in File History. If you are used to Mac OS Time Machine, it comes as close to that, but in some ways better because you can still control what gets backed up and what does not. 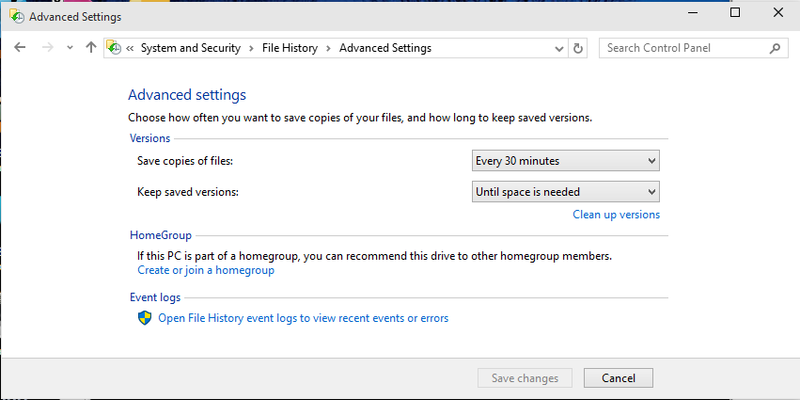 Like the Time Machine, you can ask it to back up hourly or even every 30 min of recent file changes and then automatically prune off old backups. Another advantage is that it is very well integrated with the power control of your system, especially a laptop. I was using another vendor's backup software and any time I wanted to sleep or shutdown, it refused to do so because it was in a middle of a backup. Not with this, you can go to sleep, close the cover and you won't get in a situation where you have a hot battery drained laptop when you pull it out of your case. In my situation, what I needed was automated hourly backup of some of my important documents, especially the code I am currently working on (but not quite ready to commit to Git). But if you are a teacher or an accountant just keeping the Office docs that works pretty painlessly. Cloud backup is very popular, but the problem is that you are not always on the most reliable network especially on laptops. You could also be in flight and working on documents or code. Fortunately, most laptops have a memory card slot. So I advise that you buy as big of a memory (SD card) as you can afford, I would say get at least 64 GB. So just plug it in, format it in NTFS. Since this is a solid-state memory, it does not consume much power and you know you have a backup available to you pretty much anywhere. How To Enable and Configure It? Go to your control panel and find File History which is under System and Security. You can now enable the feature and select the destination "drive" here. You can configure how often you want to back up. Here is another cool thing about this. You can easily manage which stuff on your system is backed up. The key answer to " how to select which folder to backup" is that anything included in the Libraries part of your Explorer is backed up. By default your Documents, Music, Photos and Videos are backed up. 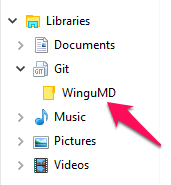 In the picture below I have dragged in WinguMD folder which contains my work stuff. Note that dragging the items in the Libraries folder does not move the folder there, but it just like the shortcuts but backups are enabled. I would not back-up videos if you have a small memory card. On a side note, I have been wondering what the Libraries were for the longest time. Now we both know what this is.